We fix your car or truck’s window the same way we would fix our own auto glass windshield with quality glass from a well known auto glass supplier. Because we work closely with the insurance companies on your behalf the billing and costliness of paying out of pocket it eliminated if you choose. Once you decide that our years of windshield repair experience in St. Louis coupled with our low prices and vast warranties are worth a shot we can procure your model cars details and efficiently deploy to your location to get you rolling again right away. We are highly respectful of your time and realize you have more to do than watching a car window be put in. Our Car and Truck Window installations are as good as the automobile was new. Not all auto glass installers are created equal. We will spare you the details and just tell you the most important thing and that is that Auto Glass is a very important structural component in your vehicle and it should be installed by a professional. There are people on craigslist st. louis window glass who would use glass seconds and inferior glue with little to no experience out the back of a station wagon to repair your car or truck. Making sure your vehicles windshield is returned to the factory standard is highly important to your passengers safety including anyone who rides in that vehicle. We make paying for our auto glass repair service easy. There are many ways to pay the choice is yours we accept most forms of payment. You can call anytime to set up an appointment calling early is better as our jobs book up quickly by the afternoon hours. It’s our pleasure to serve all of St. Louis and surrounding cities and counties Auto Glass Repair needs. Give us the Make & Model of your car for a free estimate. Masters Auto Glass is a full service Mobile Auto Glass Repair Shop, specializing in windshield replacement and auto glass repair. We replace your windshield and auto glass anywhere in St. Louis and connecting counties to manufacturer's safety standards. We use only top quality tested materials. We guarantee our windshields against all manufacturing defects. We guarantee your windshield installation against any leakage. We use special anti-corrosion primers to make sure your auto glass is installed the right way the first time. When it comes to insurance claims we make it easy. We accept all insurance companies*. we submit your claim for you and bill your insurance company directly. This saves you tie and helps you avoid laying out service payment and getting reimbursed later on. We provide our service to major used car dealers and Car Rental Companies also. The secret of our success is the company’s unfaltering commitment to superior product quality and excellent customer service and support. Superior Craftsmanship and utmost care go into every work assignment to insure a reliable and long lasting solution to the customer’s need. When it comes to Mobile Auto Glass Repair service, we come to you. 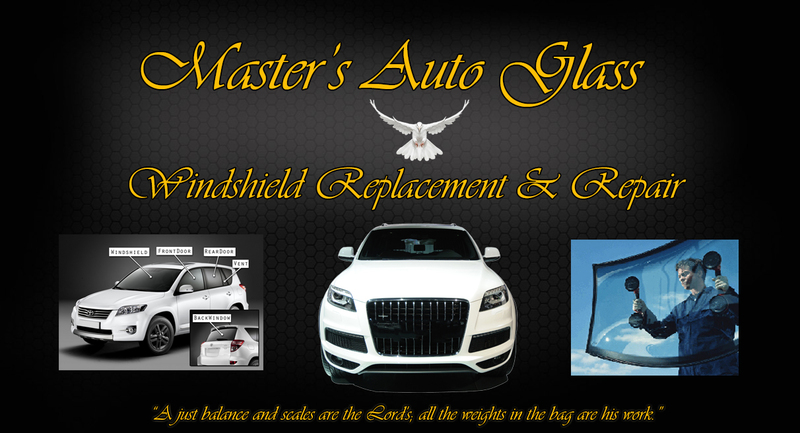 Master's Auto Glass offers mobile service to your home or business. No need to drop your car and pick it up later, or wait in a glass shop waiting room. We’ll come right to you and you can wait for the safe drive-away time in your home or work place. The vehicle can be drivable only 45 minutes after the windshield is set. Master’s Auto Glass Repair & Auto Glass Retail. The terminology for auto glass can be very confusing, but when you need a piece of auto glass it’s critical to be talking the same language as the person pricing and ordering the Glass. The first step is describing the vehicle. Year, make and model are easy. next is the body style. Number of doors, coupe, sedan,convertible, wagon or suv. If you have a pick-up you need to pick the cab style. Each make has different names for the cab style. Standard, extended, club, 4 door crew. almost all makes and models have a windshield, backglass, and door glasses. One of the biggest points of confusion is between the vent glass and the quarter glass. It’s simple, the vent is in the door, front or rear, and the quarter glass is in the body.By agreement the passenger side is the right and the driver side is the left.One point of confusion that has caused us to bring the wrong door glass is when the customer says he needs the passenger doorglass and means the rear because passengers ride in the back and we needed a front doorglass. Our customer service rep. is experienced at explaining all these terms. All of this is to make sure when we show up to replace your auto glass we have the correct part. Wet Feet, A Leaking Windshield? Are you looking for Auto Glass Repair Service in the following cities? We can replace and repair windshields in the following locations. Our auto glass service is not limited to just these areas in St.louis and Jefferson County. One of our car window specialists can be servicing the crack in your windshield while you are eating lunch or getting a haircut. Please give us a quick call or email for a FREE ESTIMATE! Copyright Masters Auto Glass | St.Louis, MO - (314) 707-7377. All Rights Reserved.